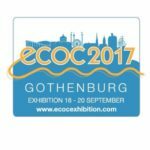 Join us at ECOC 2017 Gothemburg - Aragon Photonics Labs. Please be welcome to join us at the ECOC Exhibition in Gothemburg. Exhibition dates are 18-20 September. Venue is The Svenska Massan, The Swedish Exhibition & Congress Centre. We have booth #442 and we’ll be pleased to meet you there. There’s one BOSA for your application! © 2017 Aragon Photonics Labs. S.L.U.